Tuesday June 29th 1920 It rained last night and another heavy shower soon after dinner. The girls all went to a party at Mattie Daytons. I was busy with some sewing. At Ott in evening. 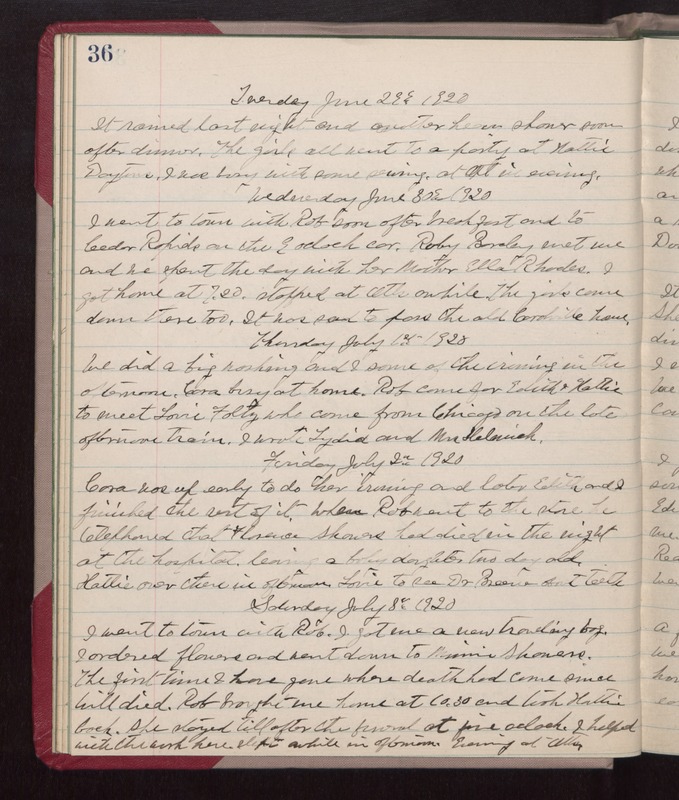 Wednesday June 30th 1920 I went to town with Rob soon after breakfast and to Cedar Rapids on the 9 oclock car. Ruby Barclay met me and we spent the day with her Mother Ella Rhodes. I got home at 7.20. stopped at Otts awhile. The girls come down there too. It was sad to pass the old Coralville Home. Thursday July 1st 1920 We did a bug washing and I some of the ironing in the afternoon. Cora busy at home. Rob came for Edith & Hattie to meet Lorie Foltz who came from Chicago on the late afternoon train. I wrote Lydia and Mrs Helmich. Friday July 2nd 1920 Cora was up early to do their ironing and late Edith and I finished the rest of it. When Rob went to the store he telephones that Florence Showers had died in the night at the hospital leaving a baby daughter two days old. Hattie over there in afternoon. Lorie to see Dr Bemner about teeth. Saturday July 8th 1920 I went to town with Rob. I got me a new trading bag. I ordered flowers and went down to Minnie Showers. The first time I have gone where death had come since Will died. Rob brought me home at 10.30 and took Hattie back. She stayed till after the funeral at five oclock. I helped with the work here. Slept awhile in afternoon. Evening at Otts.